Collar necklaces have been everywhere lately and as much as I wanted one, I never really found a style I loved at the right price. Then earlier this week while making a return at Forever 21, I spotted this beauty sitting among some other jewelry on a display table. It was the only one in the whole store and I couldn’t find a link to it online (sorry!) – also, I was pretty pleased that it was under $20. I decided to dress it down with a simple shell + jeans…and because it is such a strong statement piece, I chose to skip the arm party and let the necklace speak for itself. And speaking of amazing jewelry…come check out my first post as a contributing writer for the Poshlocket Blog – I’m sharing my favorite statement pieces from their site (all under $50)! *Click here to see if you won my Cheerfully Charmed necklace giveaway and check back tomorrow for an AMAZING new giveaway you won’t want to miss! i love this orange top on you SO much! and the necklace is amazing. fyi…i just saw a rebecca minkoff bag at nordstrom rack that looks almost identical to yours for $200! great find girl. Loving this statement necklace- it's stunning and such a great price! I love how you kept the look simple and let the necklace do all the talking. Love Love this top and this collar!!!! U always find great pieces at F21! Great eye! You look gorgeous and I love that necklace!! The statement necklace is such an amazing piece. And the top is very well chosen in order to emphasize the necklace. Love the necklace and the orange top!! Love the necklace. I am like you, I've wanted one and could never find the right style for me. But now I have to stop by F21 to see if they have this one. I also love you back, I think i prefer the white over the black one though. I guess the white one is no longer in season. Love this! I have been looking at collar jewelry as well but haven't taken the plunge yet. I'm glad you did! love your hair and your necklace! 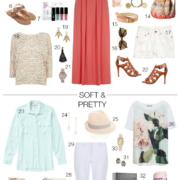 I love how you let the necklace take center stage with this outfit! Still keeping it chic with the rolled jeans and the booties! Love it! I have been looking for a collar necklace too! Love yours! I love that collar! I'm like you – looking for the perfect one. You look gorgeous! 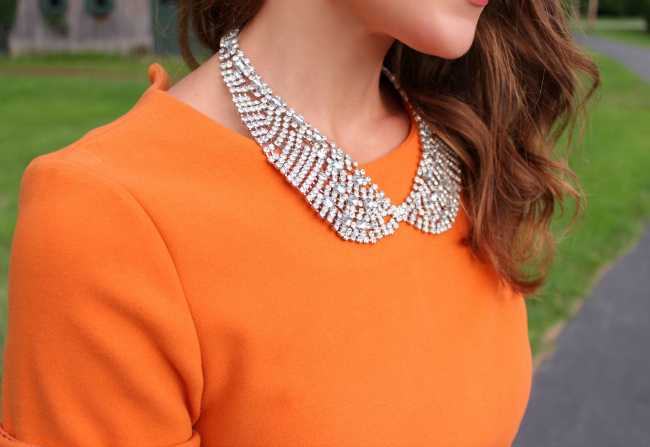 You really pull of orange… and I love that necklace! Love the color of that fun top! This is a great fall transition look! Those booties are awesome. Seriously LOVING your necklace! So pretty and what a great transition piece into fall! Love this orange colour, and the neckalce is great. You look fantastic as always! i love it Kim! orange looks fabulous on you and those booties are gorgeous! I've never tired the collar necklace style before, but it looks great! And the loose curls in your hair look great! Gorgeous necklace! F21 is the best! I like that you kept the outfit simple. Keeps the focus on the necklace. Wonderful outfit, loving that collar – gorgeous! Love your blog! I am a new reader! I love how you took a simple shirt and jazzed it up with the rhinestone necklace! The more bling the better! Thanks for all your wonderful posts! I am so in love with collared necklaces right now, and I adore this one! You styled it perfectly with the simple outfit. The necklace definitely speaks for itself! Absolutely love the collar necklace! So glad I found your blog! what a cute outfit! you are so cute & tiny! Wow, I love this whole outfit! You did a great job styling that necklace with a casual look, I would have had a hard time with it, but you look amazing! This color looks amazing on you. Really love the collared necklace. Absolutely in love with the collar! Beautiful necklace and that orange looks fab on you!!! Great orange top! Love your booties too! SO darn cute, can't say much more as I have to head to my nearest F21 to see if I can find one too! Love the simple pairing with it as well. Such a fun necklace! Loving your shoes! wow i love the color of that top! i love this outfit! the combo of the collar necklace and the studded tote is great. I found your blog via the Savers Facebook page, but I saw that you are also part of the IFB like I am! I will definitely be following.